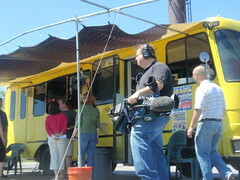 We received an e-mail at Taco Truck Central from Robin Davis Food Editor at the Columbus Dispatch asking if we were interested in a mini Taco Tour for TV. We said Si! Robin is no culinary slouch. In addition to writing, editing and cooking, she does a weekly cooking program (often at the Dispatch Kitchen at the North Market). Although she does not promote it, she is a James Beard Award winner – that is a big deal. More importantly for this mission, Robin has past experience on the streets of San Francisco sampling Taco Truck fare there. We know tacos, Robin knows tacos and our goal was to teach taco truck tidbits to the masses. We met at the site of our launching point for the first Taco Truck Tour, Little Mexico. Our criteria for picking this truck were straightforward. 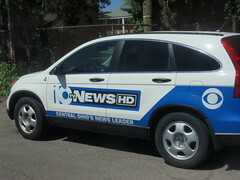 In addition to a large parking lot in an easy to locate location, this truck was the first in Columbus. We think they have the best gorditas and we really enjoy their melon agua fresca. Two 10TV crews pulled in right on time. Added to the mix was Dispatch Kitchen partner (and Taco Truck Tour veteran), the marvelous marketer Mary Martineau from North Market. A technician hooked up Hungry Woolf as our spokesperson and it was time to talk tacos. The staff at Little Mexico were very gracious and generous in serving our merry band of taco tasters. We did not have a chance to warn them the night before so with only a few minutes notice, they cooked a variety of our favorite fare. We had great gorditas with carne asada, a spread of tacos with multiple meats, several of their homemade beverages and they topped everything off with a torta. Our Taco Truck Greenhorns were converted. We had them at carne. 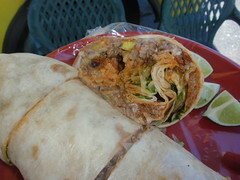 Our next stop was the new location of Los Potosinos (4915 Lincoln Park Court, around the corner from Las Delicias). We admit we are not objective about this truck. Lydia and her family have fast become our friends. However, we were here to highlight some of the unique foods taco trucks have to offer. Los Potosinos is the only pollo al carbon truck in the capital city. In addition to good food we like the friendly service here. We guided Robin and the cameras to Potosinos pollo al carbon, homemade ice cream and other specialties from San Luis Potosi. Our guests started at smitten when they pulled into the parking lot and smelled the chicken. It only got better from there. While we waited for the pollo al carbon to finish grilling, we had time to take a break and plot out our next destination. We also encountered a first time Taco Trucker, who lamented that Columbus had no good Mexican restaurants since the demise of Chi Chi’s. Needless to say, his benchmark for good was raised after a couple tacos. Our third and final destination for the day was Super Torta II. It was hard to choose only three trucks but time was short and so is the TV segment. We opted for Super Torta II for the size and the diversity of their menu. We were not disappointed. The Taco Truck Team made this a journey of discovery as well – trying a few never before tasted items on this visit. We tried the Tres Amigos Burrito: beef, chicken and pork in a burrito bigger than your head (will see if the visual for this makes the cut or the cutting room floor). 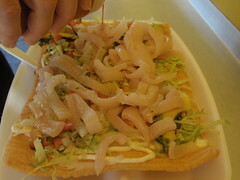 I had my first Tlayuda (which HW and TD raved about on a previous scouting mission) which is kind of a Mexican tostada/pizza with mixed meats. Rounding out the trio was what I call a big pork rind, the real name is Chicharron preparados. That was our three hour tour. 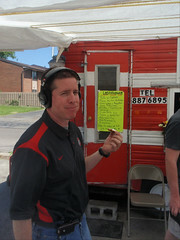 We converted the 10TV team to our taco truckin ways and hope that we might see them back again for more Taco Truck adventures. 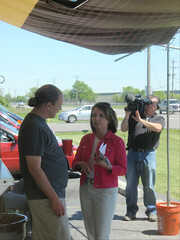 We will let you know here when the segment airs and will link a video of the segment if we can work it out. Thanks to Robin, Mary, Bryan and the rest of the crew for joining us. Viva la Vida Taco! Nice to see the love of pollo al carbon spreading! This is wonderful! Great job to all the Tracking Taco Trucks team! Very cool, guys! But where did Los Potosinos move to? Their new address is on the post and has also been updated on the map. Well done Hungrywoolf! Looks like fun! Who is this ‘Andy’ you speak of? 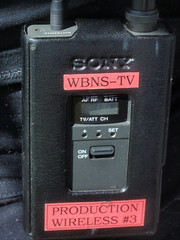 Does anyone know a date of transmission? It aired on today’s noon edition of the news. Never knew this existed but will be making my way out to the taco trucks now! 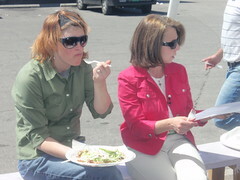 For those of you who missed the segment on 10TV News HD at noon you can view the Taco Truck Tour in the recipe archives at http://www.dispatchkitchen.com. There’s a lot of good information for those of you who want to learn about this unique dining experience.